Purpose Age-related macular degeneration (AMD) is a frequent, complex disorder in elderly of European ancestry. Risk profiles and treatment options have changed considerably over the years, which may have affected disease prevalence and outcome. 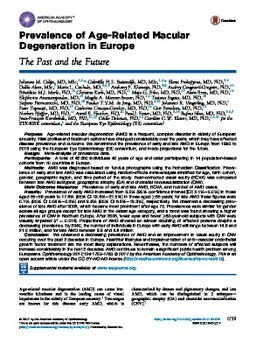 We determined the prevalence of early and late AMD in Europe from 1990 to 2013 using the European Eye Epidemiology (E3) consortium, and made projections for the future. Design Meta-analysis of prevalence data. Participants A total of 42 080 individuals 40 years of age and older participating in 14 population-based cohorts from 10 countries in Europe. Methods AMD was diagnosed based on fundus photographs using the Rotterdam Classification. Prevalence of early and late AMD was calculated using random-effects meta-analysis stratified for age, birth cohort, gender, geographic region, and time period of the study. Best-corrected visual acuity (BCVA) was compared between late AMD subtypes; geographic atrophy (GA) and choroidal neovascularization (CNV). Main Outcome Measures Prevalence of early and late AMD, BCVA, and number of AMD cases. Results Prevalence of early AMD increased from 3.5% (95% confidence interval [CI] 2.1%–5.0%) in those aged 55–59 years to 17.6% (95% CI 13.6%–21.5%) in those aged ≥85 years; for late AMD these figures were 0.1% (95% CI 0.04%–0.3%) and 9.8% (95% CI 6.3%–13.3%), respectively. We observed a decreasing prevalence of late AMD after 2006, which became most prominent after age 70. Prevalences were similar for gender across all age groups except for late AMD in the oldest age category, and a trend was found showing a higher prevalence of CNV in Northern Europe. After 2006, fewer eyes and fewer ≥80-year-old subjects with CNV were visually impaired (P = 0.016). Projections of AMD showed an almost doubling of affected persons despite a decreasing prevalence. By 2040, the number of individuals in Europe with early AMD will range between 14.9 and 21.5 million, and for late AMD between 3.9 and 4.8 million. Conclusion We observed a decreasing prevalence of AMD and an improvement in visual acuity in CNV occuring over the past 2 decades in Europe. Healthier lifestyles and implementation of anti–vascular endothelial growth factor treatment are the most likely explanations. Nevertheless, the numbers of affected subjects will increase considerably in the next 2 decades. AMD continues to remain a significant public health problem among Europeans.